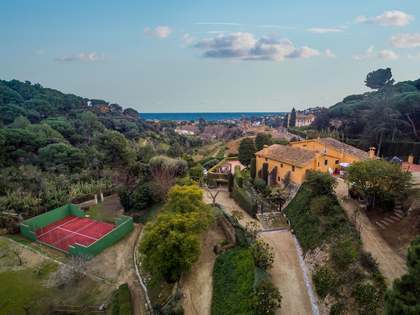 This exquisite property for sale on the Maresme Coast is located in the prestigious private community of Supermaresme. The property measures 738m² and is set over two levels with the living area on the first floor and the sleeping area on the ground floor. There is a guest house on the same plot offering parking for 4 cars with a studio apartment above. The property boasts high quality finishes, a fantastic garden with a golf green, an indoor heated pool, 24 hour surveillance and stunning views over the sea and golf course. Located in a cul de sac offering complete privacy and tranquility, it is close to international schools, the golf course and Port Balis marina. The area is characterized by its excellent quality of life, its climate, its proximity to the sea and the city, as well as its green surroundings and golf course.